Dubai Hotels and U.A.E Hotels..Dubai Hotel rates and Reservations. Welcome to Dubai. Dubai, the vibrant and amazing City of the UAE. 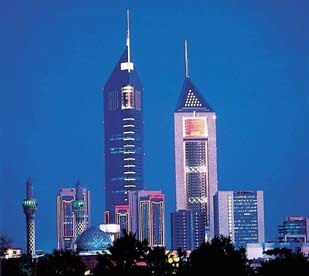 Dubai Hotels and accommodation from Cheap and Budget hotels in Dubai to Luxury Hotels and even beach resorts. Updated hotel rates for Dubai, Abu Dhabi, Sharjah, Al Ain and throughout the United Arab Emirates. Dubai hotel rates and reservations. Hotel accommodation for Stopovers in Dubai, on Business in Dubai and for holidays vacations in Dubai. Dubai is an ideal location for a stopover between Europe and Asia or Australia. Emirates will shortly start Non-Stop flights from New York to Dubai, the ideal Gateway to the Gulf, Indian sub-continent and South East Asia. For business or pleasure a wide range of hotels in Dubai, Abu Dhabi and other U.A.E locations. From Business hotels to Golf Resorts, Beach Resorts and Desert Resorts. Follow links for Abu Dhabi Hotels, Sharjah Hotels and also hotels in Al Ain, Ras Al Khaimah and Jebel Ali. Secure online Reservations. 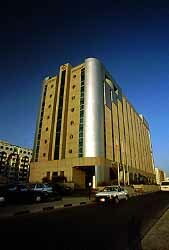 Hotel information on Dubai with Photos and details. Dubai Long Stay hotels. Enjoy our CLEAR and EASY Design. Whether just passing through Dubai for a short Stop Over between Europe and Asia/Australia, a shopping trip to Dubai, Business travel to Dubai and the UAE or relaxing at a Dubai Beach resort or Desert adventure at Al Ain, a wide choice of lodgings from budget accommodation to luxury hotels and resorts..
Click below for full hotel details and also see the Top Listings for HOT DEALS for Hotels in Dubai and the U.A.E. Rimal Rotana - Close to Shopping & Business area - Check for HOT RATE Deals ! hotels in Dubai for an overnight stop close to the airport.